This modular sweater shows off the colors of Rhythm in a simply smashing way. The pattern begins with the panel squares, and is constructed with very little sewing. It features a square neckline, and striped ribbing. It is charted in 6 sizes to produce a finished bust measurement of 32" (36,40,44,48, and 52") and uses 10 (11,12,12,13,14) balls of Rhythm in one colorway. 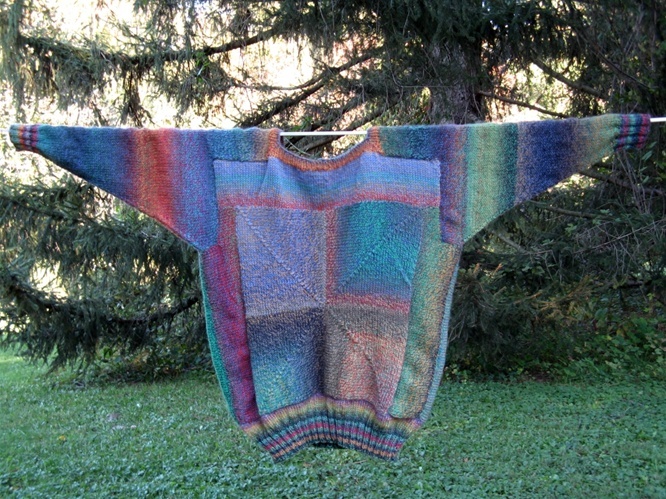 It looks harder than it is--if you can knit, purl, and decrease, you can make this sweater! Fun to make and fun to wear! style="font-style: italic;">This is a unisex pattern--knitting for men may require an extra ball due to added length in the sleeves and torso.